These three guys are looking for a new home for Easter. 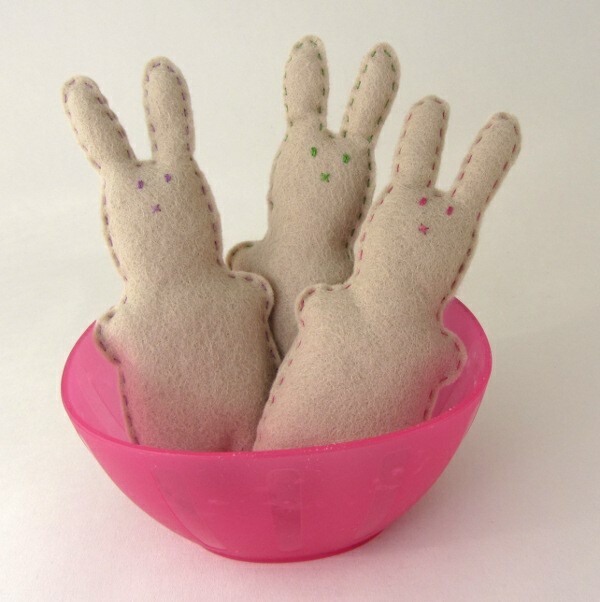 Of course we are happy here together but I made so much Easter bunnies lately that the place is jam packed and they are looking for some space. Be aware they need to be kept together at all time or they may start crying very loud. And I don’t even know their name, though rumour has it there are called Roger, Joseph and Damien. 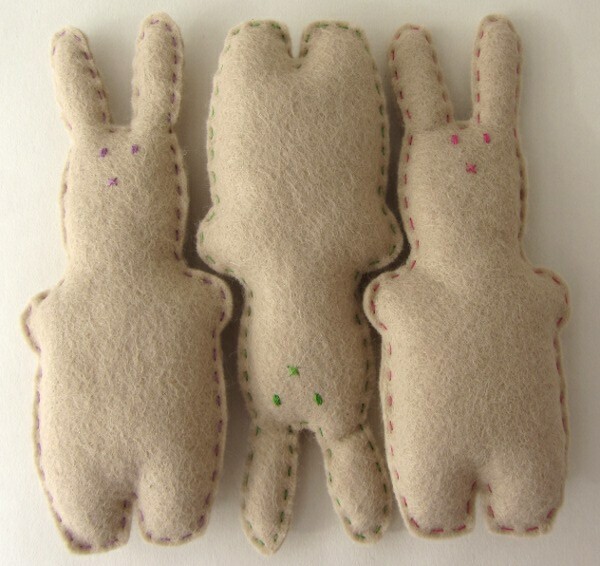 They are made of 30% wool beige felt and lightly stuffed. They are about 14cm (5.5”) high. 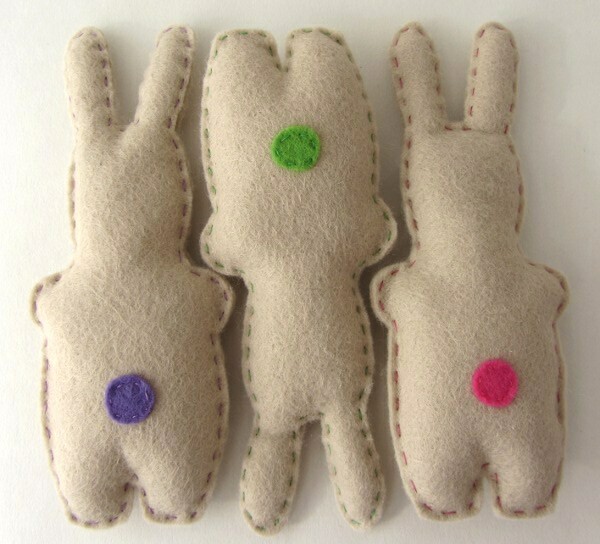 Each one is stitched with its own colour: green, pink and purple. At the back they have a little bunny tail of the same colour. You can win a chance for these guys to move into your house, all you need to do is to leave me a comment below. You can do so until Thursday 29th March @ 5.00 pm (Irish time, which is UTC). Don’t forget to leave me a way to contact you in your comment (e-mail address or link to your blog)! After this I will have a random draw to select the happy winner among all the commenters. You can get an extra chance to win if you go and like my facebook page (would put your name twice in the draw). I would ship the prize worldwide, but I can’t guarantee it would make it for Easter if the winner is outside of Europe. If you would rather make one or 100 of them yourself, I will post the tutorial tomorrow, so watch this space! So cute. Hope I win. Thank you very much for the giveaway!, they are beautiful! These are adorable…we have a nice home for them ; ) Thanks! I like you on facebook! Katy M. A.
I liked you on facebook under Kath ‘n’ Eric Grahn. Thanks again! I wish I could make one or 100 but some of us were not meant to make crafts! I love these guys and pinned them on my pinterest page. These guys are so cute! My kids would love them! Thanks for the giveaway! Those are so adorable! I would love to put them in the kiddies’ Easter baskets! I hope they’ll find their new home soon! They’re so cute! I would love to win these little guys! My cousin would adore them! They are so sweet!I’d love to win this. Thank you all for entering the competition, for your lovely and funky comments. Entries are now closed. I’ll be back soon with the winner name.